We’ll be catching the train with our steeds over the Rimutakas and going for a leisurely cruise round the scenic loveliness that is the Wairarapa. Due to the limited space available on the train for storing bikes, it is essential that you RSVP to frocksonbikes@gmail.com to secure a spot on the train (with a return ride!). Reservations will be on a first come, first served basis. Meet us at the Wellington railway station at 9.30am – nice and early so that our bikes are all on board ready for a 9.55am departure. Bring your folding bike if you have one as it will mean one more friend can join us (folding bikes can be stored in the main carriage)! Make sure you also have your train ticket ready to go too! If you want to make your own way over and meet us there, please send us an email so we can let you know when and where we’ll be. We will cruise north on the train, and likely hop off at Carterton. From here we have a leisurely loop ride planned which includes a picnic and swimming spot (bring kai and swim gears!). The day will finish up by catching a return train, and arriving back in Wellington about 6.25pm. If that sounds like your kind of Saturday, send us a quick reply confirming that you will be coming. The famous “date ride” is here again, celebrating summer, love and cycling! 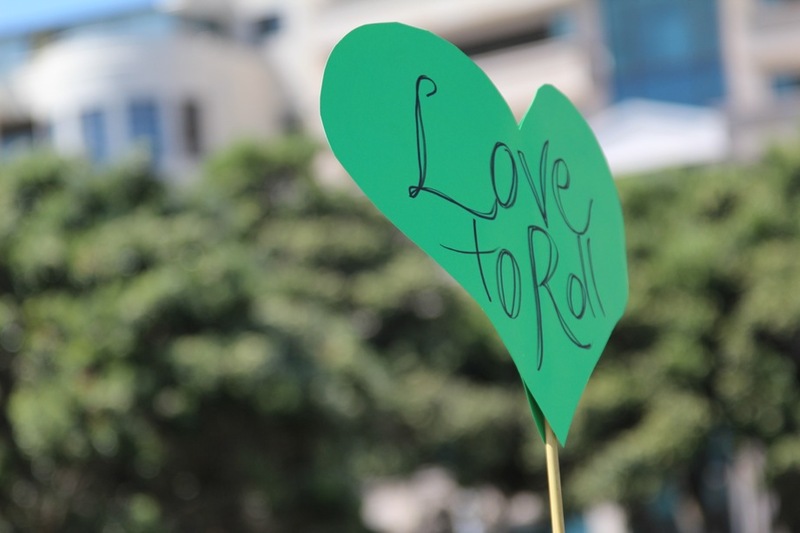 Sunday 16th February is Love To Roll! Meet atFreyberg Beach at middaydressed for a date, with your loved one(s) and your bikes. 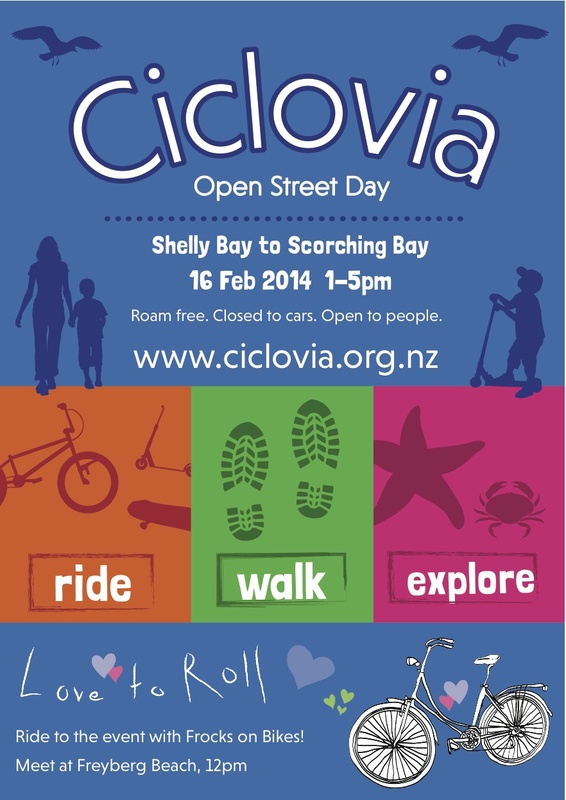 We’ll enjoy a cruisy ride around the bays to the first Wellington Ciclovía (see below) and you can win great prizes! Lovers To Roll can win prizes including “dinners for two” at Ortega Fish Shack and La Boca Loca! Want to join Love To Roll but don’t have a bike? No problem! ‘What is a Ciclovía?’ you say. I’m glad you asked! Ciclovía is a phenomenon that is taking the world by storm. It’s a simple concept – close a road to cars and open it to people. Free of traffic, Ciclovía allows people to experience their city in a whole new way. From its roots in Colombia, to downtown Los Angeles, to Melbourne, to Waiheke Island, Ciclovía has finally made it to Wellington! On Sunday 16 February from 1pm – 5pm, 3.5 kilometers of the Miramar Peninsula, from Shelly Bay to Scorching Bay, will be open for walkers, cyclists, and people on rollerblades, push scooters and in wheelchairs. It will be an opportunity to enjoy this lovely part of the Great Harbour Way without having to worry about traffic. A perfect occasion for families, people of all ages – bring your football / kite / frisbee / picnic – and grab coffee at the Chocolate Fish or Scorch-o-Rama cafes. Wheel Stylish 2013 – tickets on sale now! PARK(ing) Day is about the fact that cities are built for people, yet large swaths of urban space are dedicated to storing private vehicles. Large areas of city streets – including Wellington – are taken up by private cars that people park then walk away from. How much cooler would our cities be if we could all use some of that space for free, public, attractive and fun things? This year it’s (rescheduled for) Wednesday 25th September, and Wellington is in on it again! Wellington Sculpture Trust are the umbrella organiser coordinating with the City Council, and there are parks all over the city they’ve set aside from 8am til 8pm (during metered parking hours) for PARK(ing) Day. Frocks and like-minded groups are creating two PARKs on Lower Cuba Street that demonstrate the efficiency of bike parking vs car parking, and celebrate how urban cycling is for everyone! Pop in and visit! If the weather turns nasty, it may be cancelled – updates on our facebook page. All over the world people are opening up their streets for people to enjoy free of cars. Join the first ever Open Streets event in Wellington CBD on Dixon Street and Lower Cuba between 1-4pm on Sunday 22 September. Recapture the joy of playing in the street. Bring your deck chairs, hopscotch and hacky sack, roller blades and bikes- plus your friends and family and transform the street scape. Sounds pretty darn good to us! More info (and cancellations) about Open Street day on the facebook page. But, seeing as local body elections are coming up, we think it’s worth making cycling an issue. The more people are talking about it (and asking questions, sending emails, signing petitions, etc), the more all the councillors and candidates will take cycling seriously. This is win-win for us – segregated cycle lanes are awesome, (as those of you who have experienced them overseas will know) and will get more people cycling, which makes it safer for everyone. Have safe cycle routes to all schools and cycle lanes on all main recreational and commuter routes. Increase off road options for recreation and commuting that integrate with on road options. We’ve got two great events coming up. First up, we’re hooking up with the lovely gals at Wenches with Wrenches to tune up your bikes for Spring. Who are these Wenches, you ask? Pencil in the 2nd of October for some awesome greasy bike fixin! 14 November 2013 – Save the date! Frocks on Bikes presents “Wheel Stylish” – an evening of fashion in motionWe’ll be at a new venue, with new amazing fashion, and on new fabulous wheels, with awesome drinks and nibbles. It’s the bike fashion show of the year! If you want to get involved in Wheel Stylish (as a model, designer or backstage helper) let us know. That’s all from us this time. Enjoy those evenings as they get longer and warmer… summer is right around the corner! In the meantime, join us on facebook, be sure to follow us on twitter and browse our website for more frockin’ inspiration. We all know it’s a jungle out there on the roads…. but when are we actually within our rights to do those quick cheeky manoeuvres that get us through the traffic… or in front of the slow cars…. and when are we actually breakin’ the law? What should a savvy Frocker do to get around safely in the real Wellington streets, and what’s the ill behaviour we should avoid at all costs? Find out the answers to all these questions and more: join Frocks and the road-savvy guru (and everyday stylish bike-commuter) Marilyn Northcotte (of Pedal Ready fame) for the Road Rights & Responsibilities evening. The evening will be held at Library Bar, where you can enjoy a nice beverage while finding out everything you ever wanted to know – RSVP and you’ll have a chance to enjoy a treat! There are limited spots available, so email us at frocksonbikes@gmail.com to get in! Thanks to Marilyn and Pedal Ready for running this evening. Celebrate the last of those lazy hazy days of summer with a frocknic to the Pencarrow Lighthouse. Bring your favourite picnic outfit, your bike, some fabulous picnic buddies or dog, partner, friend or just your bike, some picnic contributions and your togs! The road is unsealed but flat. We’ll take our time and enjoy the wonderful views across the harbour! On the way we’ll find a picnic spot, and perhaps go for a swim. If you are coming from Wellington, the 10.30am ferry will get you there in plenty of time, and it is only 3km cycle further from Days Bay to the end of the road.